Charles Hutchings was born in Dowlish Wake, Somerset, in 1895. He was the son of blacksmith Ernest George Hutchings (1874-1951) and Susan Alice née Hooper (1875-1925). Ernest and Susan had seven children, born in various parts of Somerset around Dowlish Wake with the two youngest children being born in Yeovil; Ernest Frank (1892-1919), Lucy (1893-1983), Charles, Arthur (b1897), Mabel (1898-1975), Florence Jane (b1902) and Winifred Alice Kate (b1910). In the 1901 census the family were listed living in Furnham, Chard, but by 1911 were living at 131 Huish. Charles gave his occupation as 'News Paper Printer (Compositor)' and was working at the Western Gazette. Charles was a member of the Territorials and consequently was drafted at the outbreak of war. He enlisted at Yeovil, joining 2/5th Battalion, Somerset Light Infantry. His Service Number was 1897. The 2nd/5th was a duplicate of the 5th Battalion, formed at Taunton in September 1914 as part of the 135th Brigade, 45th (2nd Wessex) Division. Initially stationed on Salisbury Plain, then moving to Bath. On 12 December 1914 the battalion deployed to India, where the Division was broken up and the battalion remained in India, being attached to the Burma Division. In fact life must have been pretty quiet in India and Burma during the Great War - the Regimental History of the Somerset Light Infantry doesn't even mention the 2nd/5th Battalion after about 1916. Sadly, Charles contracted tuberculosis while in Burma. He died on 23 July 1916. He was aged just 21. In its edition of 4 August 1916, the Western Gazette reported "Mr and Mrs EG Hutchings, of 131 Huish, Yeovil have received the news that their son, Private Chas. Hutchings, of the Somerset Territorial Batt. had died from tuberculosis at Burmah. A Royal message of sympathy, signed by the Prime Minister accompanied the notification. Priv. 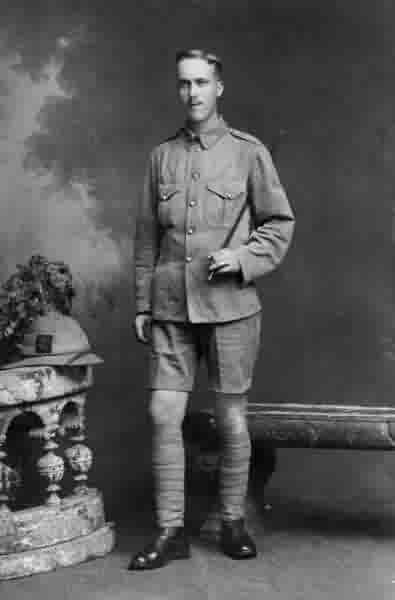 Hutchings was a member of the Territorials and was one of the first contingents to be drafted abroad. The late Private Hutchings was for about three years employed in the news department of the “Western Gazette” at which place he was held in high esteem. He took a keen interest in sport, being a member of the office cricket and football team." 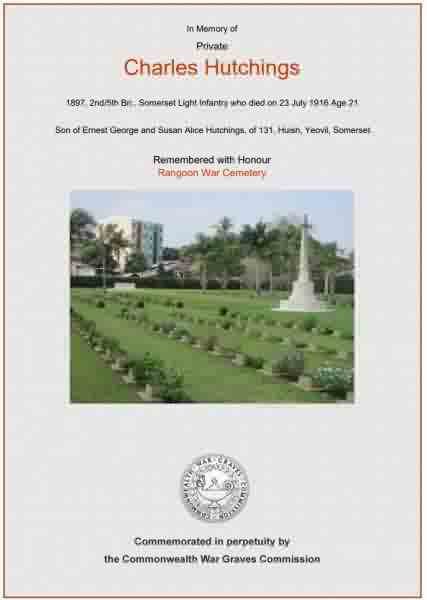 Charles Hutchings was interred in Rangoon War Cemetery, Myanmar - Grave 4.F.17. His name is recorded on the War Memorial in the Borough. 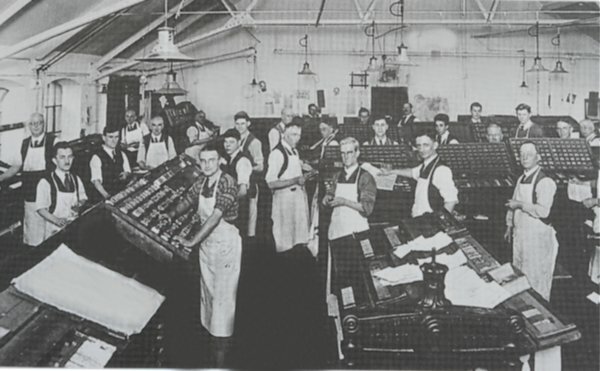 The composing room of the Western Gazette. Charles worked here for some three years. The Commonwealth War Graves Commission certificate in memory of Charles Hutchings.